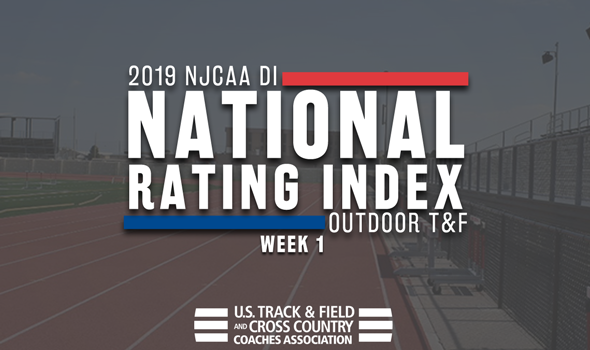 NEW ORLEANS – It’s been quite the start to the 2019 NJCAA Division I Outdoor Track & Field season. Let’s check out the National Rating Index to see how all of those strong performances have shaped the national landscape. The National Rating Index projects a two-horse race between South Plains (Texas) and Barton (Kan.) CC for the team title with an outside shot going to Coffeyville (Kan.) CC and Iowa Central CC. The Texans are the clubhouse leader on the first turn thanks to 14 marks that are ranked in the top-5 nationally, including three at the very top. Bryson Deberry is the top-ranked high jumper in the nation at 2.16m (7-1), while Rylan Olguin is tops in the pole vault at 4.88m (16-0). SPC’s 4×100 relay team is also No. 1 nationally at 40.05, while Denvaughn Whymns is billed second in the 110H at 14.05. Sitting third in the first National Rating Index are the Ravens. Coffeyville CC has nine top-5 marks nationally, including Dodley Thermitus’ No. 1 billing in the long jump at 7.73m (25-4½). Thermitus is also ranked No. 2 in the triple jump and is joined in that runner-up spot – albeit in different events – by Chris Banks (high jump) and Darius Clark (long jump). The Tritons don’t have a No. 1 mark just yet, but they do have eight in the top-5. Iowa Central is seeing positive development from Awet Yohannes in the 1500 and Courtney Lindsey in the 100 and 200, while it always consistent relay teams continue to shine. It’s going to be another tightly contested battle for the national team title between New Mexico JC and Barton (Kan.) CC. The Cougars have 12 top-5 marks of their own, led by Yoveinny Mota in the 100H and the 4×400 relay team, both of which are ranked No. 1 nationally. T’Nia Riley is a threat in both the 100 and 200 (She is ranked in the top-5 in both), while Cadeebra Calcote (800), Latavia Maines (shot put) and Christal Mosley (400) are all strong in their respective events.